The cold is here, and it's not going anywhere anytime soon! Unfortunately the best we can expect is some fluctuations in the magnitude of the cold, but not necessarily a full reprieve for a while. Let's start with the near-term. After a couple of bitterly cold days, the next reprieve arrives tomorrow and Saturday when high temperatures climb to 40° (slightly higher Friday) after cold early morning hours. Wind actually turns southerly for a brief period Friday afternoon through early Saturday before the next Arctic front seeps through the Mid-South Saturday afternoon. 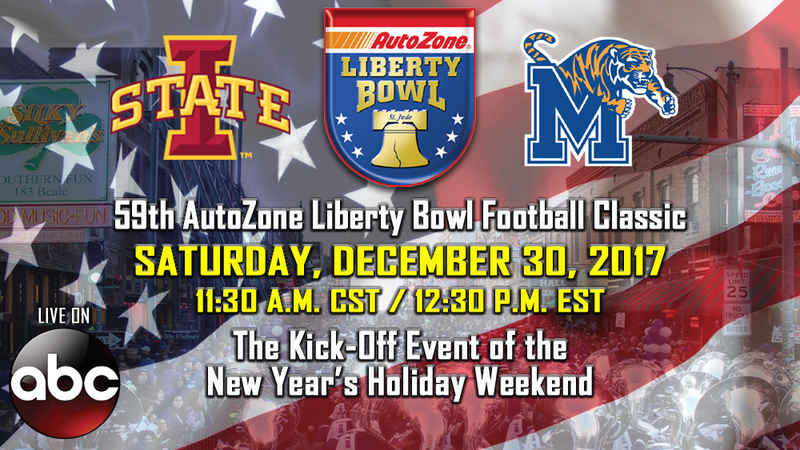 For those attending the AutoZone Liberty Bowl Saturday, it will definitely be chilly, but it could be worse! 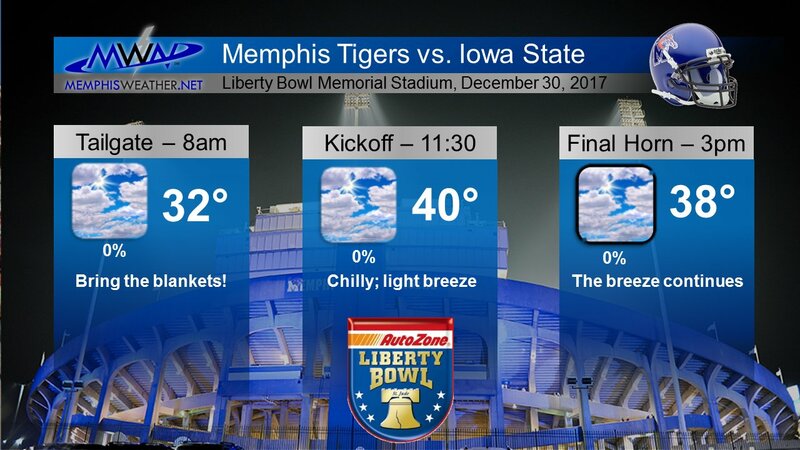 Wind will pick up a bit during the game to around 10 mph, which will keep wind chills near freezing, though highs will reach near 40° during the game. 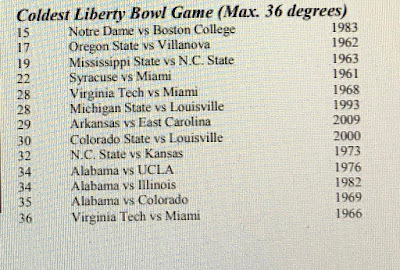 Though it will be cold, it won't even be in the top 10 coldest Liberty Bowl games on record. 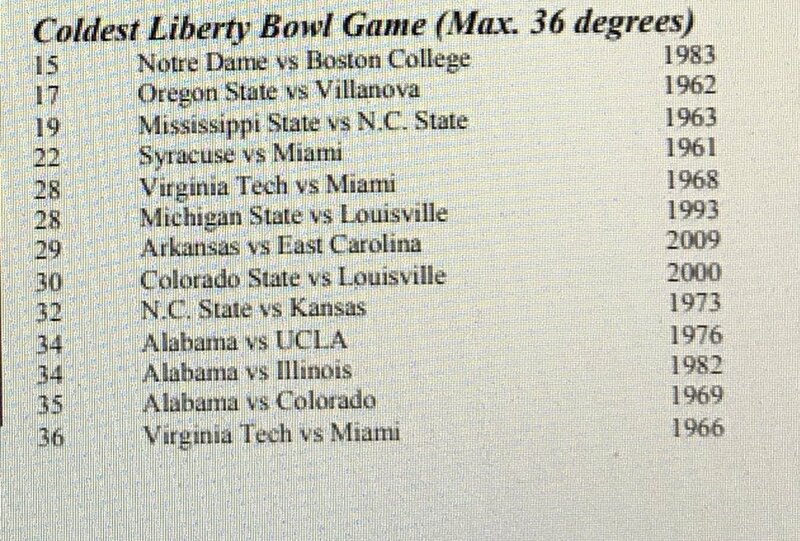 Below are the coldest Liberty Bowl games, courtesy of Bryan Moss-Namowicz of TigerSportsReport.com. The most recent bitterly cold game was January 2, 2010 (shown as the 2009 game) when Arkansas beat East Carolina, 20-17 in overtime, with a game-time temperature of 29°. 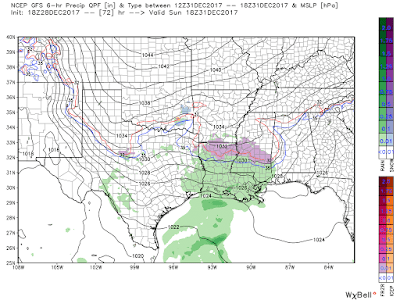 After Saturday, all eyes turn to New Year's Eve on Sunday, which is the day local meteorologists have been hemming-and-hawing over snow chances since the beginning of the week. At this time, confidence is increasing that we will see no more than flurries on Sunday with temperatures in the 20s all day. The model history on this event is that the American GFS model was forecasting light accumulation of snow on New Year's Eve for about the last week, until Thursday night. The European model had insisted on dry weather for the same period of time. On Thursday, roles reversed. The morning European model decided light snow was likely Sunday. Meantime, the American model was backing off. The European snow lasted for two model runs (Thursday morning and evening) before it too returned to form. As of today, with the shorter-range NAM model joining the fray and the Canadian model kicked in for good measure, models are now unanimous that no accumulating snow is expected. Flurries can't be ruled out. And it will be bitterly cold. 2017 will end, and 2018 will begin, on a stupid cold note with highs in the 20s Sunday, Monday, and possibly Tuesday. Lows will be well down into the teens both Monday and Tuesday. It'll be a time to remember the pets, plants, and pipes! It looks like we may get back above freezing (briefly) on Wednesday before another round of cold air arrives to end the week. Looking long-term, a more significant warm-up looks to be on the horizon heading into the first weekend of January. Let's all hope! Check the latest MWN Forecast anytime via the web or our mobile app. Links are below. Winter is back! Now how about some precip to match? The gully-washer is over and the cold air has arrived! 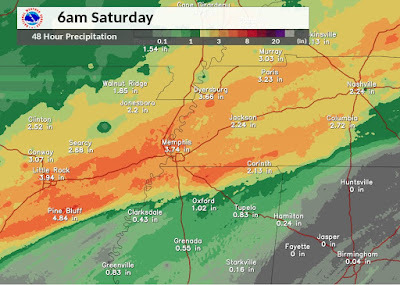 Just as predicted in Thursday's blog, widespread 3-5" rainfall totals were recorded along the I-40 corridor Friday and Friday night. A few locations got close to 6". Estimated 48-hour rainfall totals across the Mid-South through Saturday morning, courtesy of NWS-Memphis. Behind last night's cold front, cold air has infiltrated the region again and it's here to stay, with a few reinforcements arriving periodically to keep temperatures in check over the upcoming week or more. The first of these arrives tomorrow (Sunday) afternoon as a clipper system. The main precipitation chances will be to our north in the Ohio Valley, however there will be just enough moisture and upper level energy to produce sprinkles Sunday afternoon with highs in the lower 40s. Colder air quickly moves in on its heels on gusty north wind. 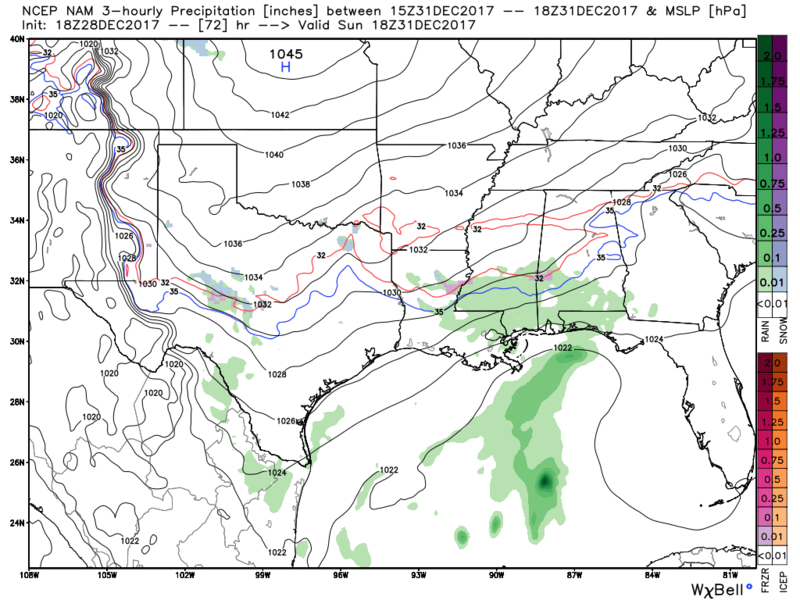 Though low rain chances should be about done by the time sufficiently cold air arrives, a few snow flurries are possible late Christmas Eve afternoon. Skies quickly clear and wind chills drop into the 20s Sunday evening on that blustery north wind. It'll be a cold evening as you head to Christmas Eve services! 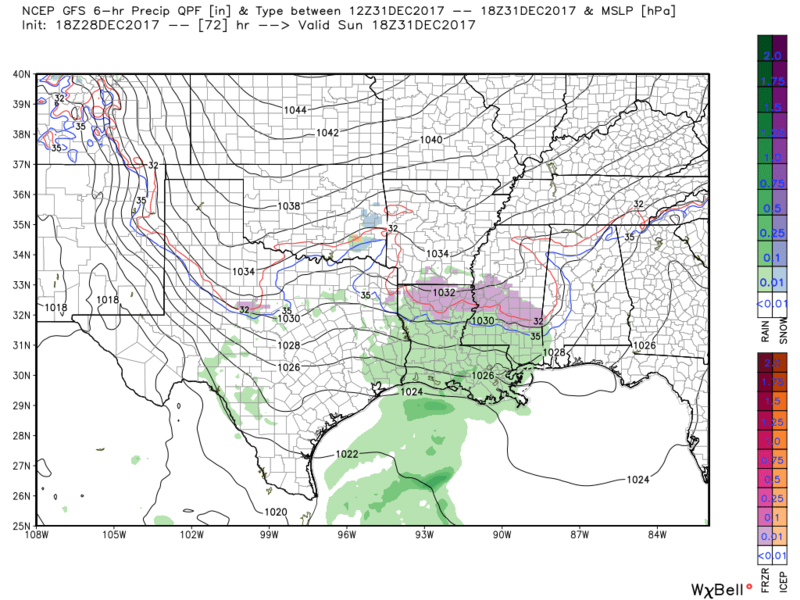 Christmas Day will be cold, but dry (sorry snow lovers, no White Christmas!) with highs in the lower 40s after morning lows in the mid 20s. Wind will be light. Tuesday continues the chilly but dry conditions as temperatures again climb from the 20s in the morning to the mid 40s in the afternoon as high pressure shifts to the east. By mid-week, we'll be watching a developing system back to our southwest. For Wednesday, it should bring mainly cloud cover and reduce high temperatures back to near or below 40. It will be a cold day! 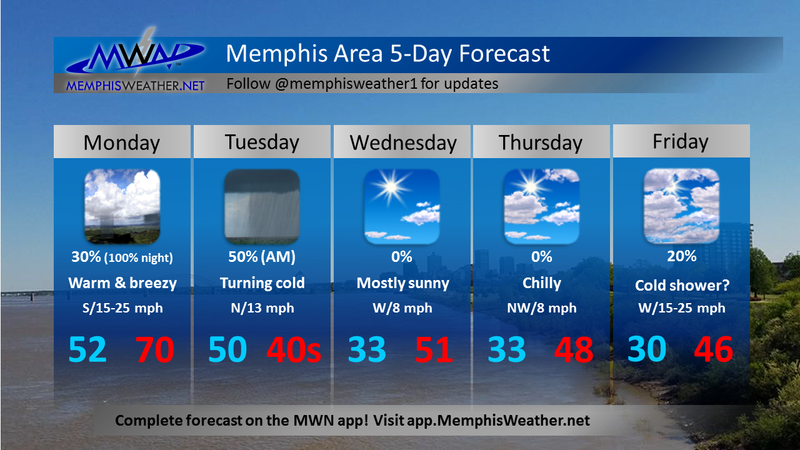 Thursday and Friday are perhaps the trickiest of the week as atmospheric energy slides by mainly to our south, but cold air remains in place across the Mid-South. 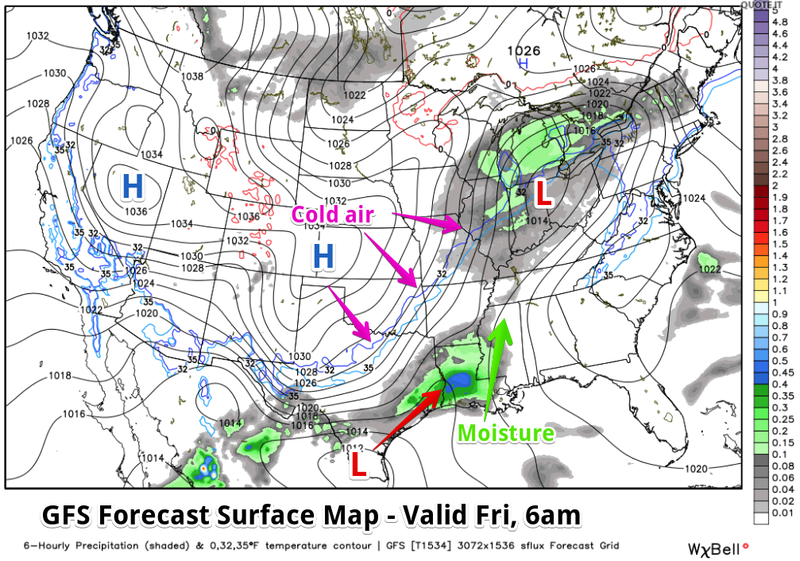 Models are still trying to settle in on how far north moisture pushes. The American GFS model from this morning keeps the systems fairly weak and the precipitation to our south, making for a dry end to the week. 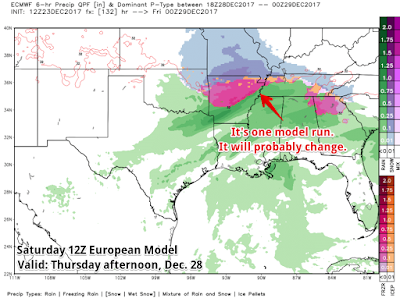 The morning European model, however, is a little more bullish with a stronger system that draws moisture further north into the region on Thursday and Thursday night. 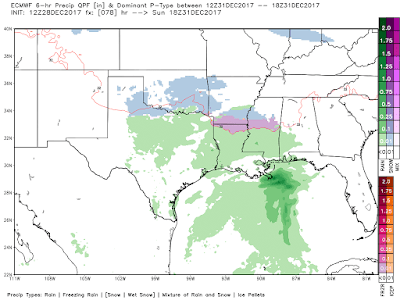 With temperatures borderline, and the possibility of overnight precipitation, a mix of wintry weather could be possible given this scenario. Fortunately, it doesn't look heavy, but if it's ice, it doesn't really matter! We'll be watching the latter half of the week carefully as we head through Christmas weekend. The Saturday morning run of the European model indicates a probability of wintry precipitation in the Mid-South on Thursday. THIS WILL CHANGE, we just don't know how yet. The pattern supports the chance of winter weather mischief. Stay tuned. 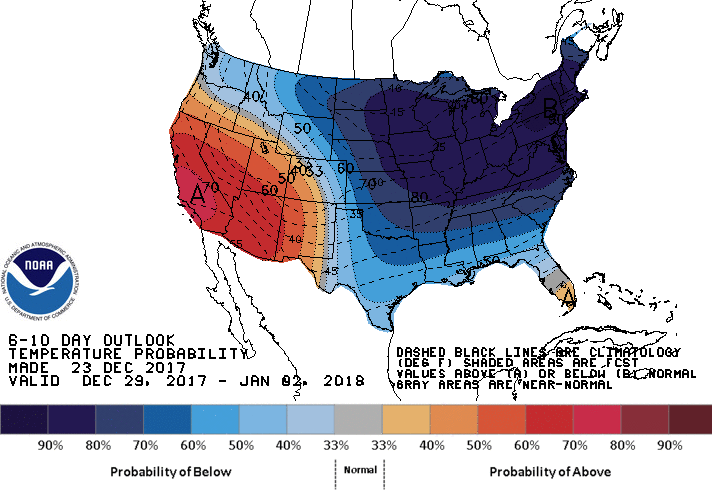 The 6-10 day temperature outlook that extends through the New Year's weekend continues the cold pattern. It looks like there are at least a few opportunities over the next couple of weeks for some winter weather mischief. Stay tuned to the MWN Forecast for the latest! 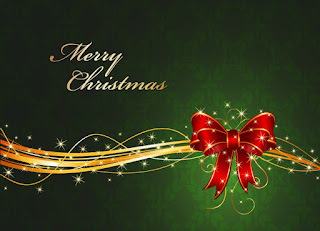 On behalf of #TeamMWN, Merry Christmas to you all! The winter solstice, the astronomical time that marks the official start of winter, occurred Thursday at 10:28am. From now through mid June, days progressively get a bit longer. But Friday may seem like the longest day of the year for children just out of school for Christmas break who can't get out due to steady, even heavy, rain! Winter will start with above normal precipitation as multiple inches of rain appear likely on Friday and Saturday. 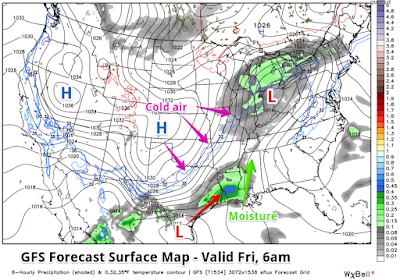 Low pressure will move across the Midwest, dragging a cold front into the region. 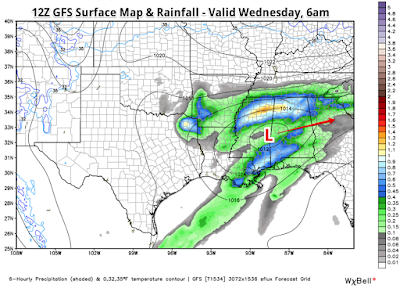 Meanwhile, another front will move through Texas and slowly towards the Mississippi River Valley near Memphis by Friday night, traveling along the stalled front. This will mean a prolonged period of potentially heavy rain as moisture from the Gulf of Mexico pools along the front. It will be mid-day Saturday before the front moves far enough east of the area as the low moves well to our northeast to bring an end to the rain. 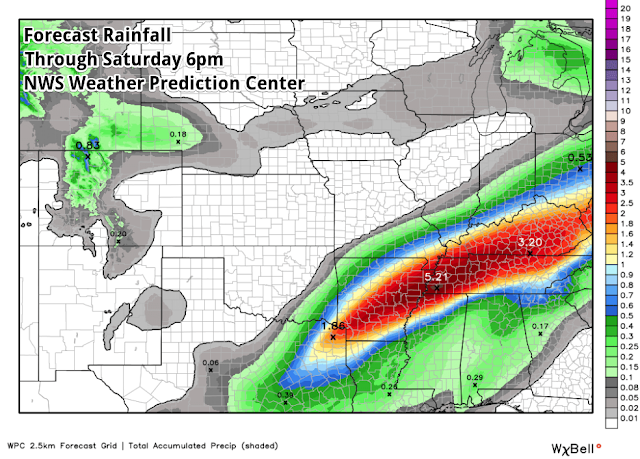 When all is said and done, some places along the I-40 corridor could see 48 hour precipitation totals of as much as 5"! Widespread 3-5" totals are likely throughout the metro, most of that falling in a 24-hour window from Friday morning through Saturday morning. Rainfall of this intensity could easily overwhelm storm drains, particularly since rainfall earlier this week served to moisten up the ground, resulting in more runoff from this storm system. Flash Flood Watches are in effect and areas that normally see ponding or deep water in heavy rain are likely to see it again. Warnings are certainly not out of the question as we see exactly how rain evolves and areas creeks and tributaries could overflow their banks Friday night. In fact minor flooding is already forecast along the Loosahatchie River in northern Shelby County. The NWS has placed the I-40 corridor, or from southwest of Little Rock to northeast of Nashville, including the Memphis metro, in a "Moderate Risk" of rainfall capable of producing flash flooding, or a 20-50% chance of exceeding flash flood guidance. 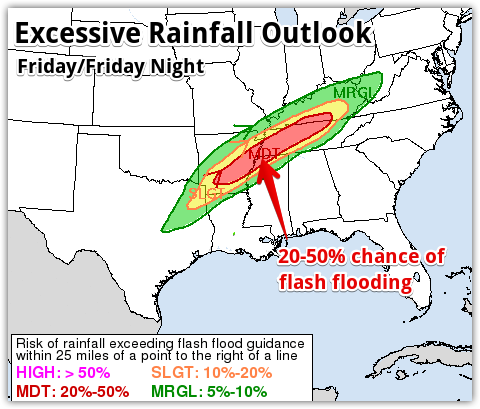 NWS Excessive Rainfall Outlook for Friday and Friday night shows a category 3 of 4 (Moderate) risk of flash flooding. A few thunderstorms are also possible in the heavy rain pockets, though severe weather is not currently anticipated, apart from the potential flooding. If you will be out on the roads Friday, or particularly Friday night, you are encouraged to watch for signs of high water and avoid those areas! You know the mantra: "Turn around, don't down!" There is nothing so important that you have to risk your life, or others, for the most direct route. Allow extra time to reach your destination if you must be out and be sure the wiper blades are operating well! As rain moves out Saturday morning, cloud cover will stick around and it will get colder. After highs in the 60s Friday, Saturday's temperatures will remain in the 40s all day with a cold north wind. Christmas Eve and Christmas Day were be monitored closely earlier this week for the potential for some winter mischief, but it appears the only "mischief" we might get could include some additional cloud cover on Sunday and the very low potential for a few sprinkles or a late evening snow flurry, as an upper level trough moves through. Most moisture will remain north of the region, so I expect a mainly cold, dry Christmas Eve with lows in the 30s and highs in the 40s. Christmas Day itself will not be white, which is not a major surprise given that our odds any year of a White Christmas stand at less than 2%! Expect a cold day with some sunshine and highs that barely reach out of the 30s as polar high pressure builds in to our north. Next week - another threat of winter mischief? Tuesday and Wednesday also looks dry and cold with lows in the 20s and highs in the 40s. A slow moderation in temperatures is expected as we near the end of the week when the next potentially wet system starts to move in from the west behind the retreating polar high. This one we'll need to again monitor closely as an early arrival of precipitation into a retreating cold air mass could mean the potential for a wintry mix. 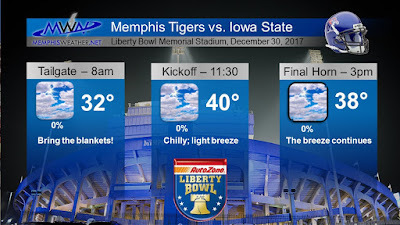 For now, we'll call it a rain, and hope that it is gone by Saturday, December 30, when the Memphis Tigers take on Iowa State in the Liberty Bowl! 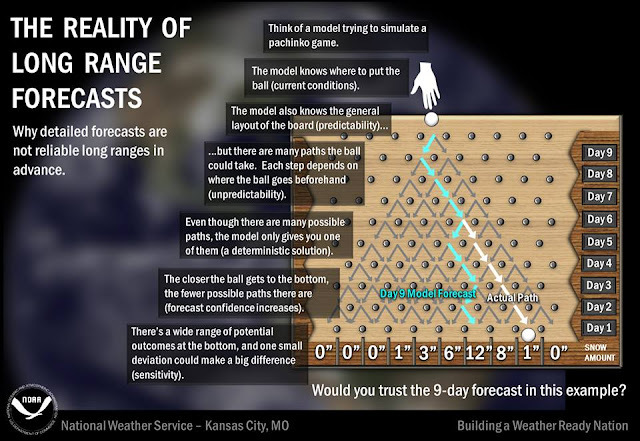 It's simply too far out with too much model uncertainty to say otherwise! Thank you so much to all of you who follow us throughout the year! 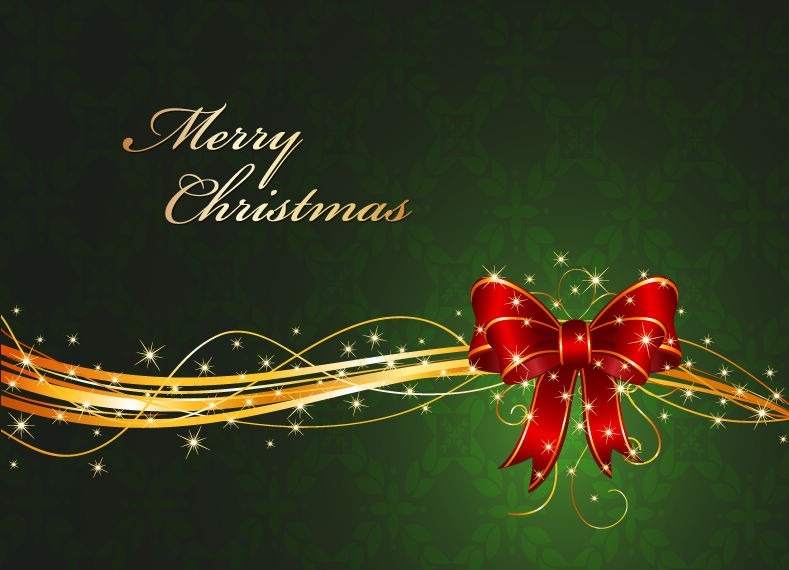 We wish each of you a very Merry Christmas! Stay tuned to the latest updates tomorrow and Saturday, as well as through the holidays, via our social media channels and mobile app! Pertinent links can be found below. Cooler and dry weather has dominated the Mid-South weather pattern for more than a week, with no rain since the 5th and daily average temperatures below normal for 9 consecutive days through Friday. That pattern will be interrupted by a more progressive one the next week. 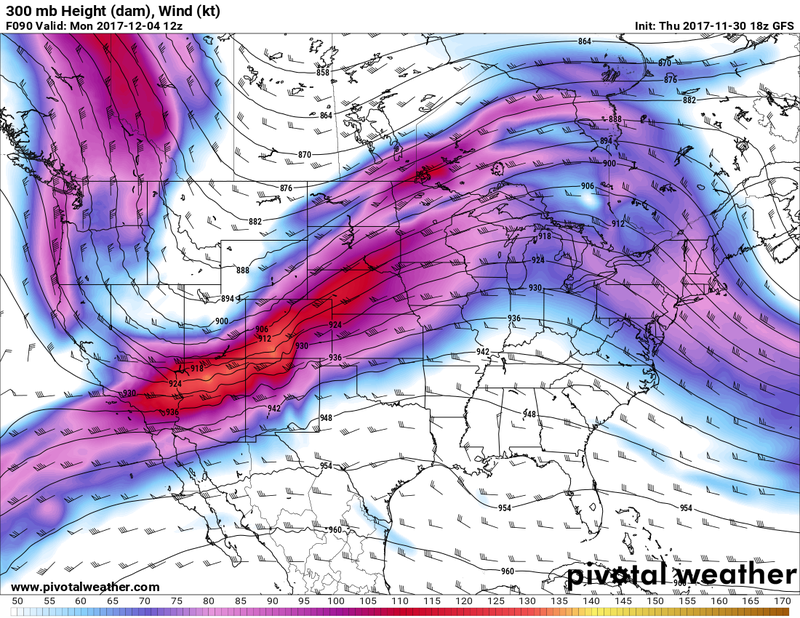 The polar jet stream remains to our north, but a series of upper level low pressure systems in the southern, subtropical jet stream kick out of the desert southwest across the southern U.S. This will mean a couple of shots at rain in the next several days, but overall milder weather. The first upper-level system moves through tonight, bringing welcome rain to dry ground. Rain amounts have trended up a bit and I expect most of us could get at least a half inch. Light rain could begin as early as 10pm or so, with the heaviest after about 3am and lasting through 8am. By late morning, rain will be gone, leaving a dry rest of your Sunday. Following overnight lows in the lower 40s, we should see afternoon highs rebound to the upper 50s with partial sun. The Mid-South will be between systems Monday, though with increasing low level moisture, morning drizzle and low clouds are expected. The afternoon looks better with highs probably into the 60s. By Tuesday, the next low pressure system will begin ejecting out of the southwest flow from the desert southwest and toward the region. 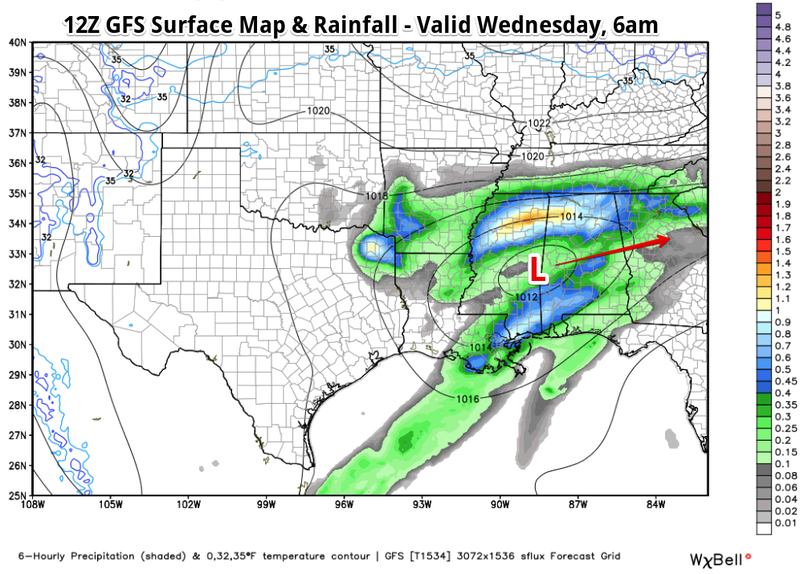 This will bring a chance of showers Tuesday and higher chances Tuesday night into Wednesday. This system is where medium-range models start to diverge just a bit. The track of the low will be key to placement of heaviest rain. The European model brings a stronger system right over the region with heavy rain likely. The GFS (American) model takes the low to our south, and thus the heavy rain misses us. Both indicate that by Wednesday night the rain is gone however. Thursday will be another "tweener" day with mild conditions, but to our west, a harbinger of potential trouble lurks. Much colder air surges into the Plains behind a cold front as upper level low pressure develops in the southern stream once again. That cold air moves towards the Mid-South Friday as the low brings additional precipitation chances to the region. Temperatures do appear to stay warm enough on Friday for all precip to be liquid, but it could start to get colder as the day goes on. 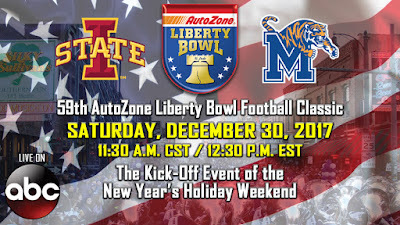 For Christmas weekend, all bets are off and all options appear to be on the table. The model data to this point has not been consistent either run-to-run (remember, models run multiple times a day) or with each other. Even this morning, the GFS and European are nowhere close on potential outcomes beyond Friday. The overall pattern though does appear to favor cold and potentially wet. We'll be watching carefully throughout the week for additional clues and some consistency in the model data. In the meantime, it's not unwise to start giving some thought to potential hazardous scenarios. In this case, that could mean difficult travel due to snow, or perhaps more likely ice, throughout Christmas weekend. Now is not the time to hype, or even to just give credence to the worst case scenarios without acknowledging the equal likelihood of nothing at all. If you see that in your social media feeds, it's time to stop following that source. 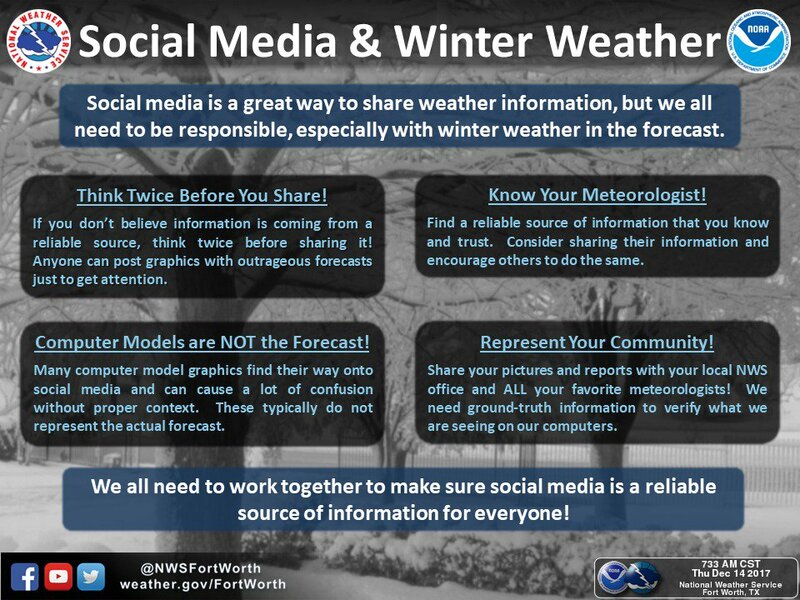 Below is some great advice from NWS-Fort Worth as winter weather scenarios start to pop up, especially more than a few days out. And here's another good one that reminds us how foolish it is to trust detail of a long-range forecast, courtesy of NWS-Kansas City. We'll have further updates throughout the week on our social media channels, this blog, and in the official MWN Forecast. Stay tuned - and remember a day-old forecast is worse than a day-old donut! The story dominating the headlines across the Southeast to end the week has been the snow, which dropped a few inches of the white stuff across Mississippi, Alabama, and points south. But when will the Memphis area get in on the winter wonderland? It'll depend on whether the presence of cold air and sufficient moisture merge at the same time, and in the right place! Right now, chances look slim for the foreseeable future however. 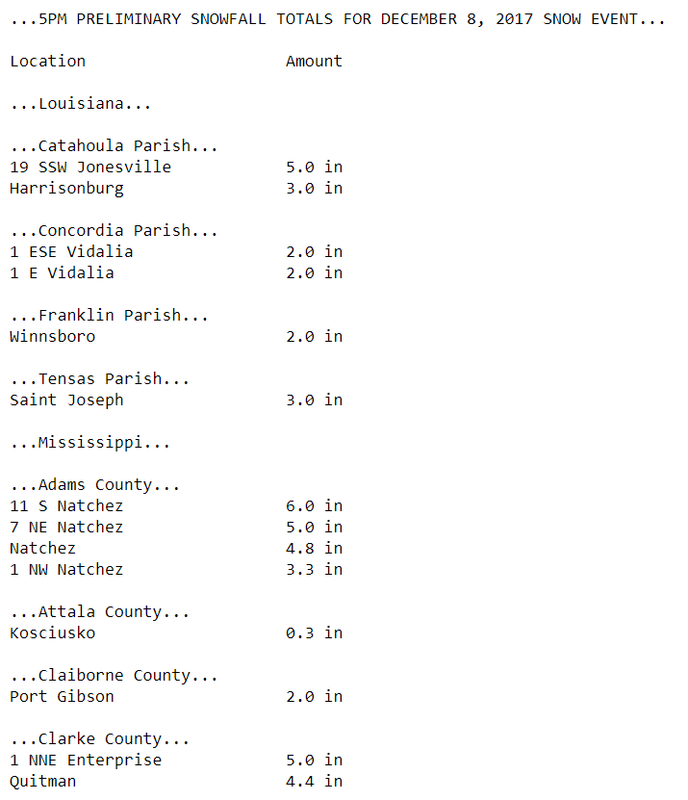 A selection of snowfall totals from Friday from across Mississippi and Louisiana. More can be found here. Temperatures over the next 48 hours across the metro will be warming comfortably, with highs in the mid 50s on Sunday and low to mid 60s on Monday. Skies will be mostly sunny both days, but with a strong south to southwesterly wind that helps bring in that warmer air. Lows overnight drop to the mid to upper 30s. But don't get adjusted to the warmth quite yet. Winter's icy blast will be back on Tuesday with colder temperatures filtering on south once again. A cold front will shove away those warmer temperatures at the start of your work week, replacing them with highs only in the mid 40s. The front will not bring anything in the way of precipitation to the Mid-South unfortunately though. As the cold front approaches Memphis from the north, any precipitation will be focused out to the east and northeast of the area. But here comes the cold again! Sunny skies will continue through the end of the coming work week, with partly to mostly sunny skies for Wednesday, Thursday, and Friday. Highs each day will be in the low to mid 50s, but the overnight lows drop off the proverbial cliff. Lows will drop to near 30 Wednesday morning and again Friday morning. If you have not prepared your plants, pipes, and pets already for old man winter, it is time to do so! Fortunately, a warming trend is in the cards by next weekend, with highs in the upper 50s on Saturday. 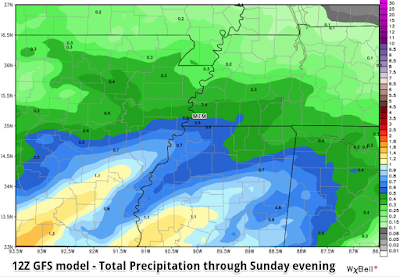 However, that will also bring our next decent chance of rain for the Mid-South, as the next storm approaches. All eyes will then turn to the last week before Christmas, where the roads will be just as jam-packed as the malls! Prepping for the holiday season? You can rely on our team of MWN meteorologists and interns to bring you the most updated weather forecast for the Memphis metro. Also follow us on Facebook and Twitter for the latest weather conveniently in your social media stream. Speaking of convenient, download our MWN Weather app for forecasts at your fingertips while you're on the run finishing that holiday shopping. Temperatures ended up a bit above average for the month, with warm temperatures to start and end the month but a string of cooler than average days in the middle of the month. The highest temperature of the month (83°) occurred on the second during a strong of days that reached the 70s. Most of the month featured highs in the 50s and 60s, however, with no sub-freezing morning lows at the airport. 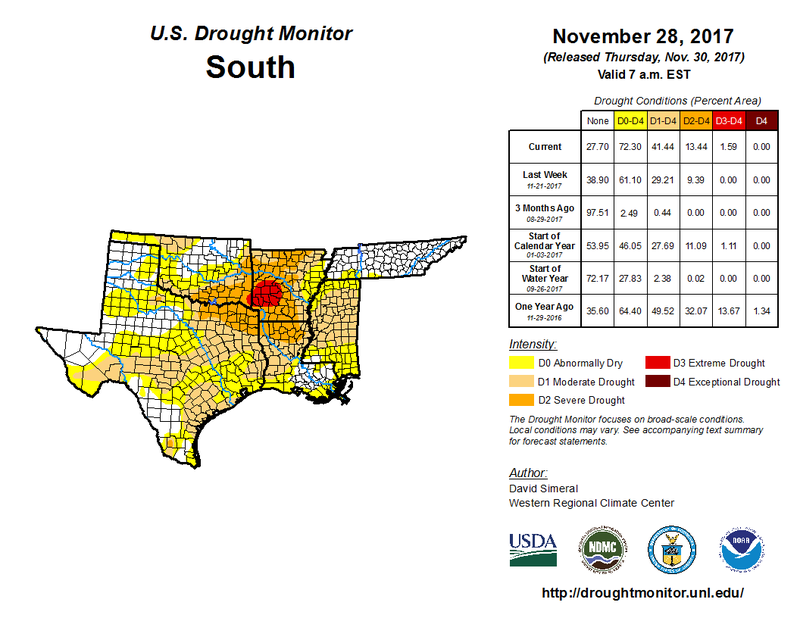 The month continued a recent dry spell with precipitation about 1/3 of a normal November and concentrated on a handful of days. Thus, the month ended with "abnormally dry" conditions across parts of the metro on the Drought Monitor. There was no severe weather for the month and no warnings issued. Comments: Year to date, the average temperature of 66.8° is 2.1° above average and fifth warmest on record. For the period September-November (meteorological fall), the average temperature was 65.2°, which is 1.0° above average. Comments: Only 0.44" of rain fell after the first week of the month. Year to date, precipitation has totaled 44.12", which is 92% of average. For the period September-November (meteorological fall), precipitation totaled 7.46", which was 5.10" below average, or 59%. Comments: Only 0.68" of rain fell after the first week of the month. One more 70-degree day, then winter arrives! I recorded a video discussion on the major changes to the weather pattern arriving early Tuesday. Watch below for full details! And here's the forecast for those just wanting to cut to the (cold) chase! The month of November is wrapping up and we now head into the season in which people start asking (more) about important things (like snow). It's also the end of a couple of other seasons though. 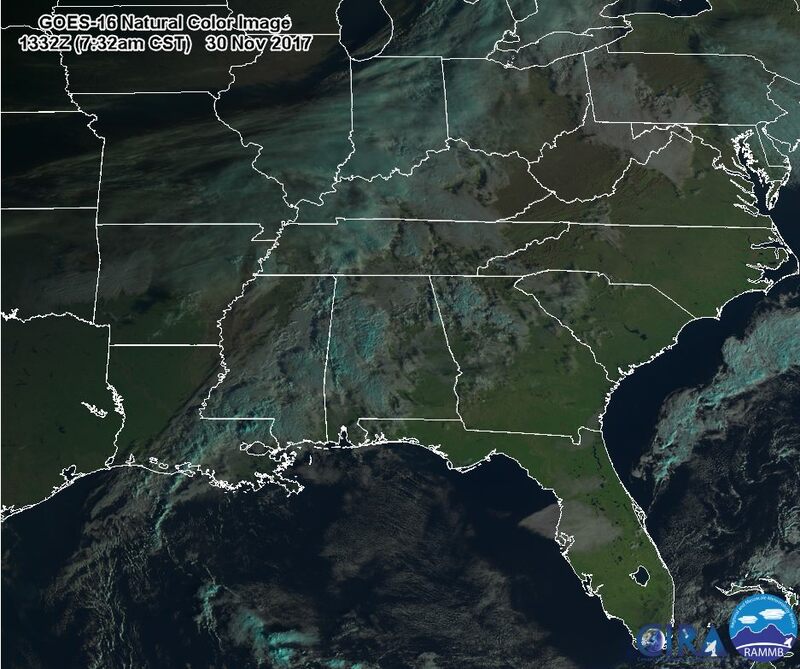 Here's more on that, as well as a look ahead to this weekend's beautiful weather, a major weather pattern shift on the horizon, and why a satellite that produces amazing imagery went dark today. 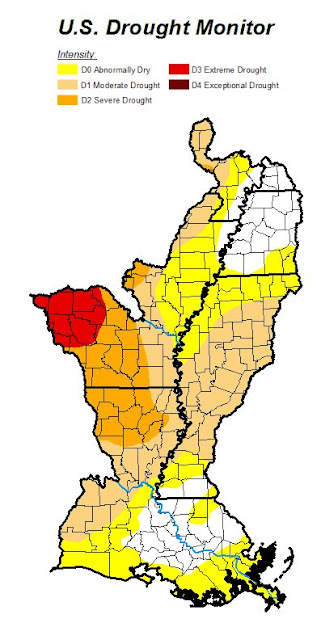 The U.S. Drought Monitor, zoomed into the Lower Mississippi Valley, shows "abnormally dry" conditions creeping into the metro from the south. 3. So when will this warm weather end? Not for several more days! With a fairly tranquil weather pattern nationwide for the next few days, no major fronts are expected through the weekend. We'll see mild weather with highs in the 60s continuing into early next week as high pressure aloft dominates. As for weekend activities, the forecast is grand! 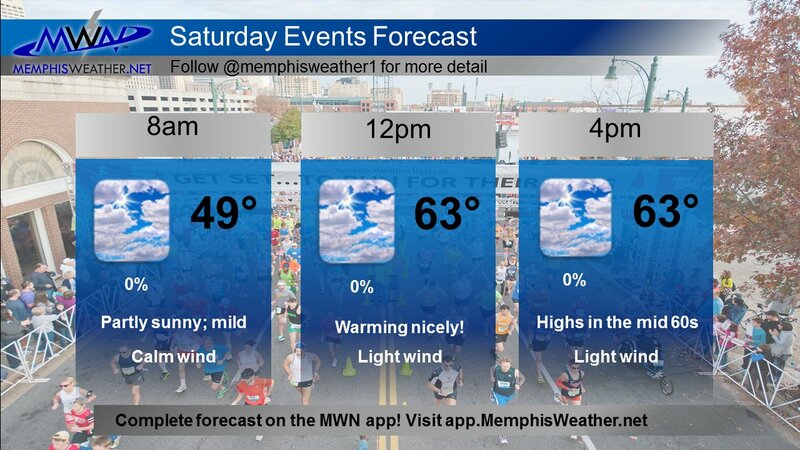 Here's a planner for Saturday, which features the St. Jude Memphis Marathon, a Tiger football watch party at the Liberty Bowl, and Christmas parades among other things. You can find the official MWN Forecast here or in our app. 4. What brings the warm weather to an end and how cold does it get? If you looks above again at the jetstream forecast for Monday morning, you'll see a huge dip over the western U.S. As that shifts east, it "dips" even further south, allowing cold air from Canada to spill south into the eastern U.S. Early signs are that this pattern - dominated by an eastern U.S. trough and western U.S. ridge - could last right into the middle of December. There will be ebbs and flows of course, but much colder air will be found in the eastern U.S., including the Mid-South, in this pattern. As the pattern shifts, watch for the potential for some heavy rain and thunderstorms near a front that moves through sometime between next Monday night and Tuesday night. A relief from the dry weather, but also the end of fall most likely. Below is what this morning's GFS (American) model ensemble said about temperatures for the next 2 weeks. Note that these are not exactly right, but give you a good idea of the trend. 5. Finally, November 30 also brought to an end (if everything goes well) the "preliminary, non-operational" phase of GOES-16, our new awesome-sauce meteorological satellite that was launched just about one year ago. It's been in testing phase for much of this year and has provided dramatic and beautiful imagery from 22,500 miles up. For the next 3 weeks, its propulsion systems are pushing it a bit further east from its test location, where it will become fully operational in mid-December as GOES-East. This day will be nearly as monumental in the meteorological community as the day it was launched and the day it sent back its first images. For more on GOES-16 (formerly GOES-R) see this blog post. By this time next year, its sister satellite (GOES-S/17) will likely be operational over the west coast as GOES-West. A new chapter in satellite meteorology is being written! Below was the parting image, in natural color, from GOES-16 this morning at 7:32am CST.